1st & 3rd Monday, 7:00 p.m. 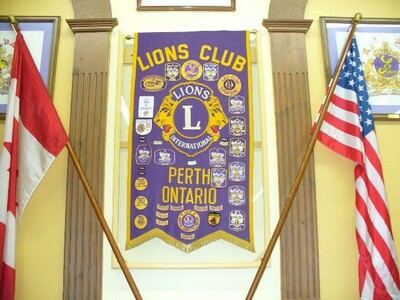 The Lions Club of Perth was chartered on November 11th 1953 with a total of 60 members; sponsored by the Smiths Falls (ON) Lions Club. Our club is honoured to recognize Past International Director Lion H.H. Ernie Moore who was the first Perth Lions Club Secretary. Lion Ernie was recognized by the Lions Clubs International and rose to the position of International Director for Canada for the period 1985 - 1987. Since 1953 our club has contrinuted significantly not only to the community in which we live but to worthy causes throughout the world through contributions to Lions Clubs International. We have also contribute to numerous charities and persons who are in need of assistance when requested to do so in and around the community of Perth. The Salvation Army, The Perth Food Bank, The Great War Memorial Hospital (now in excess of $125,000.00), The Heart Institute, The Children Hospital of Eastern Ontario, The Canadian Diabetes Association, The Canadian Cancer Society, The Children Breakfast program at a local elementary school, bursaries to two high schools,four bursaries to students enrolled in Algonquin College, money for unfortunate families who have been burn out victims or have another serious need, eye glasses for very specialized need by children, collect eye glasses for third world countries, The Canadian National Institute of the Blind, Camp Dorset for persons requiring dialyses treatment and sponsored children to attend this specialized camp as well, we have also sponsor other children to attending other camps, and have purchased a dog for a person who is visually impaired. In addition, our club donated the Millennium Gates to the Town of Perth located in Stewart Park, a soccer field at Conlon Farm and contributed monies towards pillars in conjunction with the Perth Lioness Club to the entrance of the Glass Palace at the entrance to the Perth Basin. To date, the Lions Club of Perth remains an active club with a current membership of 41 Lions and we remain proud of our accomplishments. The International Association of Lions Clubs is the largest service organization in the world with a membership of over 1.4 million members in 207 countries and geographical areas spanning the globe and continues to grow.